ATLANTA... Only 22 cases of Guinea worm disease were reported worldwide in 2015, an 83 percent reduction from the 126 cases reported in 2014, the greatest single percentage reduction in human cases in the history of the global campaign. These provisional numbers are reported by the ministries of health in remaining endemic countries and compiled by The Carter Center. When the Center began leading the international campaign to eradicate the parasitic disease in 1986, there were an estimated 3.5 million Guinea worm cases occurring annually in Africa and Asia. "As we get closer to zero, each case takes on increasing importance. Full surveillance must continue in the few remaining endemic nations and neighboring countries until no cases remain to ensure the disease does not return," said former U.S. President Jimmy Carter. "The Carter Center and our partners are committed to seeing that this horrible parasitic disease never afflicts future generations." As of the end of 2015, there were only 20 endemic Guinea worm villages in four countries — all in Africa, compared to 23,735 villages in 21 countries across two continents in 1991. The 22 indigenous Guinea worm cases were reported in isolated areas of Chad (9), Ethiopia (3), Mali (5), and South Sudan (5). Although Mali and South Sudan each experienced an outbreak in 2014, both programs achieved more than an 85 percent reduction by redoubling their surveillance and response efforts. "Guinea worm reductions in South Sudan and Mali in 2015 are even more remarkable because both countries have significant insecurity or civil unrest and had the largest number of cases in 2014. For these nations to make this much progress against disease under such dire circumstances is heroic by any measure," said Dr. Ernesto Ruiz-Tiben, director of the Carter Center's Guinea Worm Eradication Program. Considered a neglected tropical disease, Guinea worm disease (Dracunculiasis) is contracted when people consume water contaminated with Guinea worm larvae. After a year, a meter-long worm slowly emerges from the body through a painful blister in the skin. Guinea worm incapacitates people for weeks or months, making them unable to care for themselves, work, grow food for their families, or attend school. Without a vaccine or medical treatment, the ancient disease is being wiped out mainly through community-based interventions to educate and change behavior, such as teaching people to filter all drinking water and preventing contamination by keeping anyone with an emerging worm from entering water sources. Guinea worm will be the first parasitic disease to be eradicated and the first disease to be eradicated without the use of vaccine or curative treatment. "We believe that with adequate commitments by the governments of Chad, Ethiopia, Mali, and South Sudan and continued donor support, cases of Guinea worm disease can be reduced to zero worldwide in the near future," said Dr. Donald Hopkins, Carter Center special adviser for Guinea worm eradication. "While occurrence of Guinea worm in dogs in Chad presents a new challenge, we have successfully addressed unexpected developments throughout this 30-year eradication campaign and have put measures in place to tackle this one as well." Chad – The appearance of Guinea worm in hundreds of domestic dogs in Chad has emerged as a recent challenge. Dogs are not the parasite's natural host. This is an unusual epidemiology not seen at this level in other nations currently or formerly endemic for Guinea worm disease. Human cases in 2014 (13) and 2015 (9) have been found in remote villages spread over hundreds of miles along the Chari River. At those locations, during the annual fish harvest, dogs have been eating raw fish or fish guts carrying Guinea worm larvae. The program continues to expand health education messages, surveillance, and research, with a specific focus on preventing the consumption of inadequately cooked or raw fish by both dogs and humans. Ethiopia – In 2015, Ethiopia reported three cases from Gog district in the Gambella region, which remains the nation's only Guinea worm-endemic area. Ethiopia is well positioned to stop transmission in 2016. It also reported three cases in 2014. Political will, security, and sensitive surveillance are critical to stopping Guinea worm disease in Ethiopia. Mali – Since 1992, the Mali Guinea Worm Eradication Program has reduced the number of cases from 16,024 to just five reported in 2015. However, insecurity that began in April 2012 has hindered interruption of Guinea worm disease transmission because the national program has not been able to operate fully and consistently in all of its Guinea worm-endemic regions. In 2015, security improved, and the program reduced cases by a notable 88 percent (five cases in 2015, compared to 40 in 2014). Additionally, the program expanded the total number of villages under active surveillance to 581. South Sudan – The South Sudan Guinea Worm Eradication Program reported five cases in 2015 compared to 70 cases in 2014, a reduction of 93 percent. The program also maintained seven consecutive months (November 2014-May 2015) reporting zero Guinea worm disease cases. This success is noteworthy in light of continued political turbulence, and the program continues to function effectively. 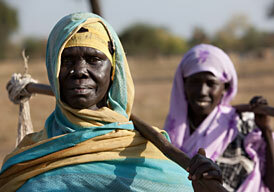 Since 2006, the number of Guinea worm cases in South Sudan (20,582), has been reduced by 99 percent. "Tens of thousands of community-based health workers have shown daily acts of courage to improve the lives of their families and neighbors over three decades, often under very dangerous circumstances. Because of them, the end is in sight," said Craig Withers, acting vice president of Carter Center Health Programs. The Carter Center leads the international Guinea worm eradication campaign and works in close partnership with national programs, the World Health Organization (WHO), U.S. Centers for Disease Control and Prevention (CDC), UNICEF, and many other partners. The Carter Center provides technical and financial assistance to national Guinea worm eradication programs to interrupt transmission of the disease. When transmission is interrupted, the Center provides continued assistance in developing or strengthening surveillance in Guinea worm-free areas and prepares nations for official certification by the WHO. CDC provides technical assistance and verifies that worms from these final patients are truly Guinea worms. The presence of Guinea worm disease in a geographic area indicates abject poverty, including the absence of safe drinking water; UNICEF mainly assists countries by helping governments to provide safe sources of drinking water to priority areas identified by the national Guinea Worm Eradication Programs. The WHO is responsible for certifying countries as Guinea worm-free and is the only organization that can officially certify the eradication of a disease. Many generous foundations, corporations, governments, and individuals have made the Carter Center's work to eradicate Guinea worm disease possible, including major support from the Bill & Melinda Gates Foundation; the United Kingdom's Department for International Development (DFID); Children's Investment Fund Foundation (CIFF) - United Kingdom; the Conrad N. Hilton Foundation; and His Highness General Sheikh Mohamed bin Zayed Al Nahyan, Crown Prince of Abu Dhabi, in the name of His Highness Sheikh Khalifa bin Zayed, President of the United Arab Emirates (UAE). The DuPont Corporation and Precision Fabrics Group donated nylon filter cloth early in the campaign; Vestergaard's LifeStraw® donated pipe and household cloth filters in recent years. Abate® larvicide (temephos) has been donated for many years by BASF. Key implementing partners include the ministries of health in endemic countries, The Carter Center, WHO, CDC, and UNICEF. Get up-to-date Guinea worm resources including monthly case reporting, graphs, news articles, and human interest stories.